acnelan offers a cross-cutting approach to address the numerous factors that trigger acne, combining an intensive clinical treatment with intelligent home care products. Acne is caused by the overstimulation of the sebacous glands that is caused by an increase in circulating androgen levels in the body. This causes an increase in the oil produced within the skin, as well as thickening of the surface skin layer. This process leads to the blockage of pores, and entrapment and proliferation of our skin’s normal bacteria which results in the formation of an acne pustule. If left untreated, acne can lead to permanent scarring, poor self-image, depression and anxiety. The earlier you treat acne, the more manageable it will be. ACNE PROBLEMS? NO MORE WITH THIS SIMPLE AND EFFECTIVE SOLUTION. acnelan offers a cross-cutting approach to address the numerous factors that trigger acne, combining an intensive clinical treatment for professional use with a complete range of intelligent home care products. 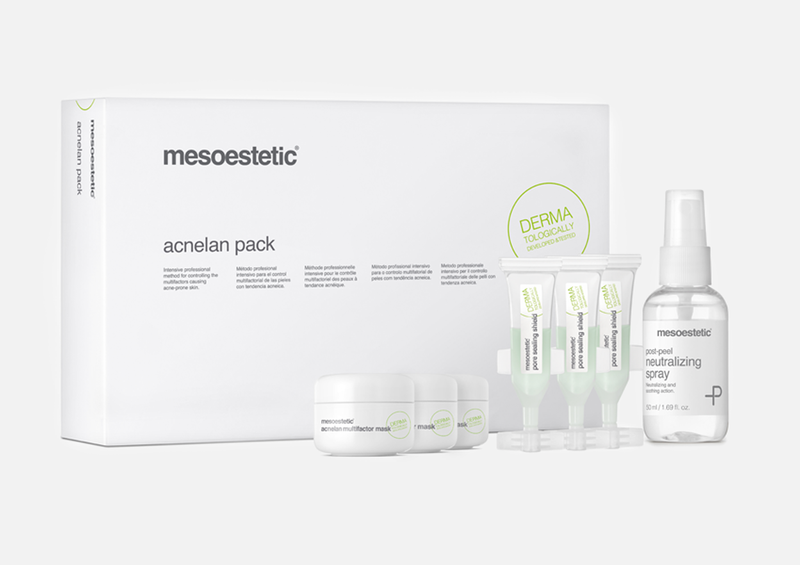 At the core of acnelan is the unique m.acne complex™ with active ingredients such as salicylic acid, mandelic acid, sodium lepargilate and shikimic acid which actively fight acne. The m.acne complex™ not only provides a deep cleanse, it also decreases redness and swelling. Furthermore, it has a depigmenting effect – in vitro studies show the m.acne complex™ decreases melanin synthesis. acnelan is a professional, specialised treatment method. It consists of 3 medium-depth peels at 15 – 21 day intervals, and prepping the skin prior to the treatment is essential. Some clients see results after one session, while others take longer. The number of treatments needed is unique to everyone. Following a thorough skin analysis, your skin care specialist will suggest a treatment plan specifically for you. locate a certified meso professional.